Coverage: Live BBC Red Button & online on Friday 12:25-19:00, on BBC Two on Saturday 13:00-16:00, and on BBC Two (not NI, viewers can watch online) on Sunday 12:30-16:00. 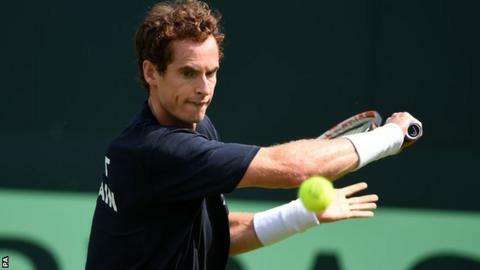 Andy Murray believes Great Britain are ready to overcome a strong France team in their Davis Cup quarter-final at Queen's Club. Britain will try to reach their first World Group semi-final since 1981 when the tie starts in London on Friday. Murray, 28, hopes to win at least two points in singles just a week after reaching the Wimbledon semi-finals. "Over the last couple of years we've had good performances. I think this is our level now as a team," he said. "This weekend is going to be a tough ask against four top grass-court players that are all really, really good players, so it will be a tough challenge for us, but we have an opportunity to win if we all play our best level." James Ward is set to take up the other singles place, in the week when he broke into the world's top 100 for the first time, with Jamie Murray and Dom Inglot among the doubles options for captain Leon Smith. Andy Murray admitted that he is not yet able to put last Friday's defeat by Roger Federer at Wimbledon completely behind him. "It was a tough day and I'm still thinking about it," said the Scot. "I'm also trying to learn from the match as well. "You have to analyse it a little bit and look at the tournament as a whole, and Queen's - think about those things and see what I can do better in the future." France have an undeniable advantage in terms of strength in depth, with 10 men in the world's top 100 and four in the world's top 20. World number 11 Gilles Simon, number 12 Jo-Wilfried Tsonga and number 13 Richard Gasquet will vie for singles places, while Nicolas Mahut and Pierre-Hugues Herbert won the doubles titles at Queen's Club last month. "We're still going to talk all together before the final decision," said France captain Arnaud Clement. "I have a lot of options. That's what I want to have; I'm a lucky captain. "Maybe after the first day, I can change the plan." British captain Smith expects a close battle in the best-of-five tie, with the winners going on to face Australia or Kazakhstan in the semi-finals in September. "Both teams are playing well," he said. "In the Davis Cup, we've seen before that things can happen; you can upset rankings. "It's very different playing for your country than it is as an individual and some players do that better than others. We've just got to hope that somehow we can get three points on the board. "I'm sure we can but it's going to be very, very difficult."